One tool that does the job is Prio, the Priority Saver. It adds this functionality to the Windows Task Manager. The most important feature that it introduces is the ability to save priorities for processes. 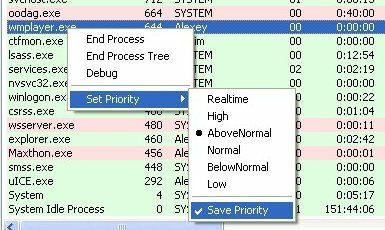 To do that you simply select another process priority and check the Save Priority entry in the same menu as well. Every time the process is started it will run with the selected priority from now on. The different colors are also added by Priority Saver. Green colors are assigned to processes with a digital signature while red colored ones do not have one. Hovering the mouse over a process will display a tooltip with additional information about it. Priority Saver adds two new tabs to the Windows Task Manager as well which are called Services and TCP / IP. The services tab displays all services currently installed on the system. This menu makes it possible to start and stop services and change their startup mode which makes the services.msc application redundant. The TCP/IP tab displays all incoming and outgoing network connections of the computer. Tooltips aid in determining the process that is responsible for the connection. Process Priority is free for personal use and runs fine in Windows XP. There is no information available about other supported operating systems. Update: The program is no longer available on the Internet. I suggest you take a look at the free alternative Prio – Process Priority Saver, or the excellent Process Lasso.